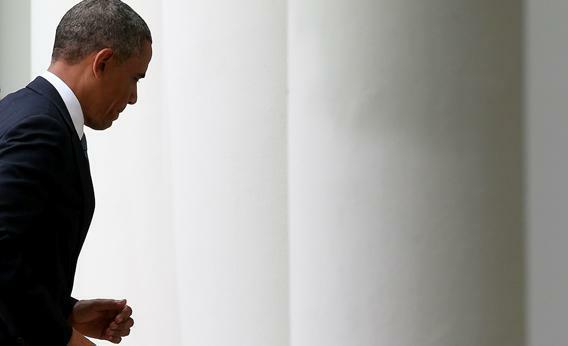 Benghazi, AP, IRS: How Obama plays off one scandal against another. How is Obama coping with multiple scandals? By playing them off against one another. What can a president do when he’s hit simultaneously by three scandals? Answer: play them off against one another. That’s what President Obama tried to do at this afternoon’s press conference. Over the past week, he’s been besieged by one crisis after another. First came congressional testimony about the administration’s failure to protect its diplomats in Benghazi, Libya. Then came the disclosure that the IRS had targeted conservative groups for special scrutiny. Then came reports that the Justice Department had secretly reviewed phone records of reporters and editors at the Associated Press, apparently to find out who leaked information about a terrorism investigation. On Monday, Obama responded to Republican complaints about his administration’s editing of its talking points after the Benghazi debacle. Obama called these complaints a “political game” that distracted attention from the real issue: protecting “diplomats around the world who are in very dangerous, difficult situations.” Essentially, the president was playing the national security card: He’s the adult looking out for bad guys who want to harm us, while the kids in Congress play games. That’s one way to deal with an attack from both flanks: Flag your opponents for hypocrisy. But the other way is pit the attackers—or at least the attacks—against one another. If you’re being accused of not doing enough to protect U.S. personnel in Benghazi, use that accusation to justify your surveillance of the press. Claim that you’re investigating the reporters to protect the diplomats. Obama’s maneuver is cynical. There’s no real connection between the AP story and our failure to protect the team in Benghazi. And pitting the two scandals against one another won’t make either of them go away. But it does confound the larger ambition of the president’s enemies. It blocks them from uniting the three scandals under a common theme. You can paint him as Nixon, the corrupt, imperial president. Or you can paint him as Carter, the wimp. But you can’t do both. The addition of other scandals makes the GOP’s message problem that much more difficult. Today, the Justice Department’s inspector general added a fourth mess: Terrorists were allowed to fly on commercial flights because the department altered their identities, in exchange for their cooperation, and neglected to convey the new identities to the Terrorist Screening Center. So now we have two stories about Obama’s coordinated surveillance—IRS and AP—and two stories about his lack of coordination and surveillance: Benghazi and the no-fly list. The good news for Obama, in the midst of these contradictory scandals, is that his enemies can’t put together a unified message. The bad news is that he can’t, either.